William Sandy is an important Australian indigenous artist, he is one of the first from the Pitjantjatjara involved in the Aboriginal art movement. 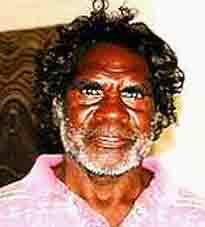 Sandy began painting for Papunya Tula Artists cooperative in 1975. COLLECTIONS: William Sandy work is represented around the world including Kelton Foundation USA, Donald Kahn art collection USA , John Weber Gallery New York, Museo Centro Cultural Arte Contemporaneo Mexico, Isaacs Art Center Museum and Gallery Toronto, Lowe Art Museum Miami, University of Miami, Embassy of Australia Washington, Grand Hyatt London, Grand Hyatt Jakarta, Groninger Museum Holland, Oxford University England, Art Gallery Western Australia, Art Gallery of South Australia, National Gallery of Australia, Art Bank, National Gallery of Victoria, Museum and Art Gallery of the Northern Territory, Queensland Art Gallery, Homes a Court, Art Gallery of Western Australia, Broken Hill Regional Art Gallery NSW, Wagga Wagga Regional Art Gallery, University of Queensland Australia, Araluen Art Centre Northern Territory, IBM Kawasaki Gallery Japan. 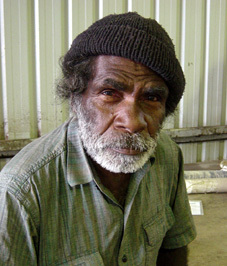 William Sandy was the first artist from the Pitjantjatjara involved in the Aboriginal Art Movement. 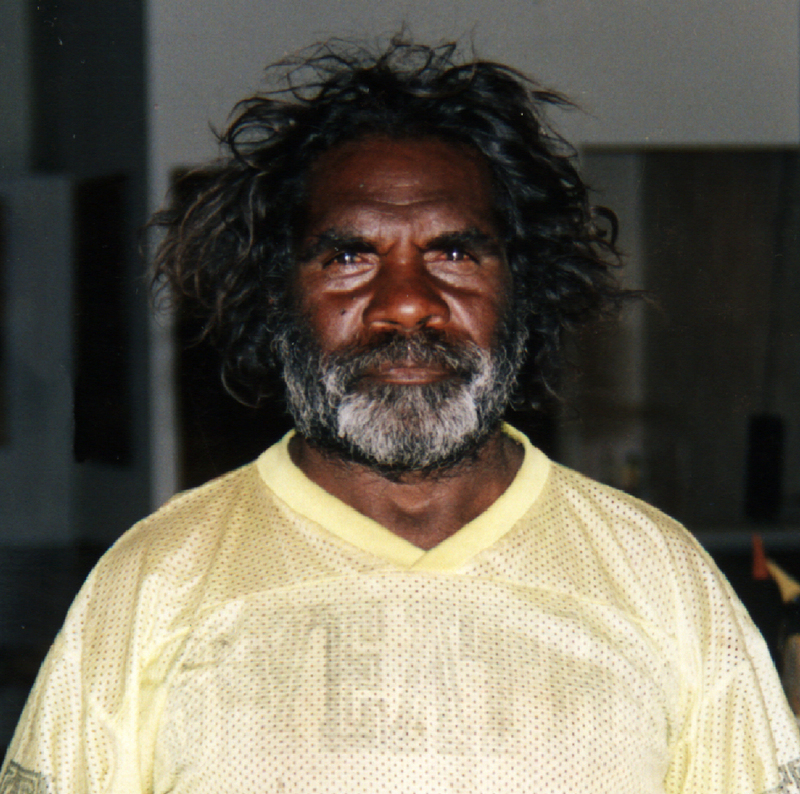 Sandy began painting for Papunya Tula Artists cooperative in 1975. William Sandy work is represented in Worldwide Collections . 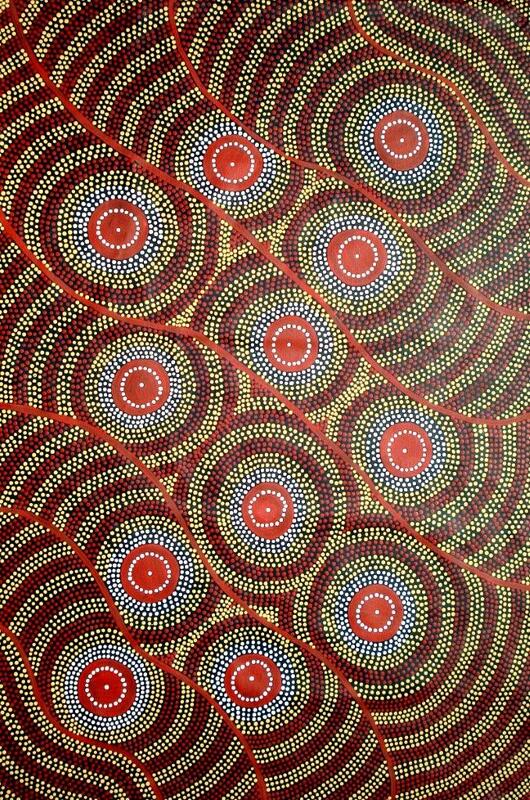 William Sandy is one of the most important Australian indigenous artists , began painting for Papunya Tula Artists in 1975. B iography Australian Encyclopedia Aboriginal Artists dictionary of biographies page 337 . William Sandy was the first artist from the Pitjantjatjara to be involved in the famous Aboriginal art movement. Papunya Tula Artists cooperative formed in 1972 was owned and operated by Aboriginal people from the Western Desert of Australia . 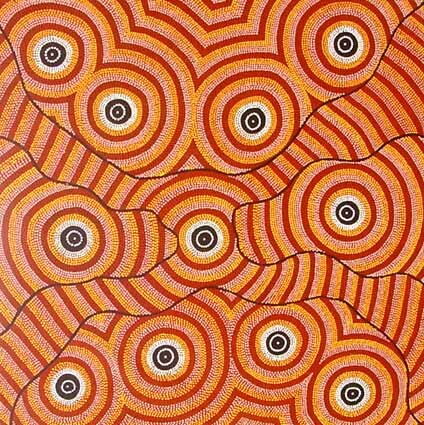 William Sandy is one of the Master a rtists who started the Aboriginal art movement as Billy Stockman and Long Jack Phillipus in the 70's. Most Master artists have passed away, and the younger generation is learning western customs. 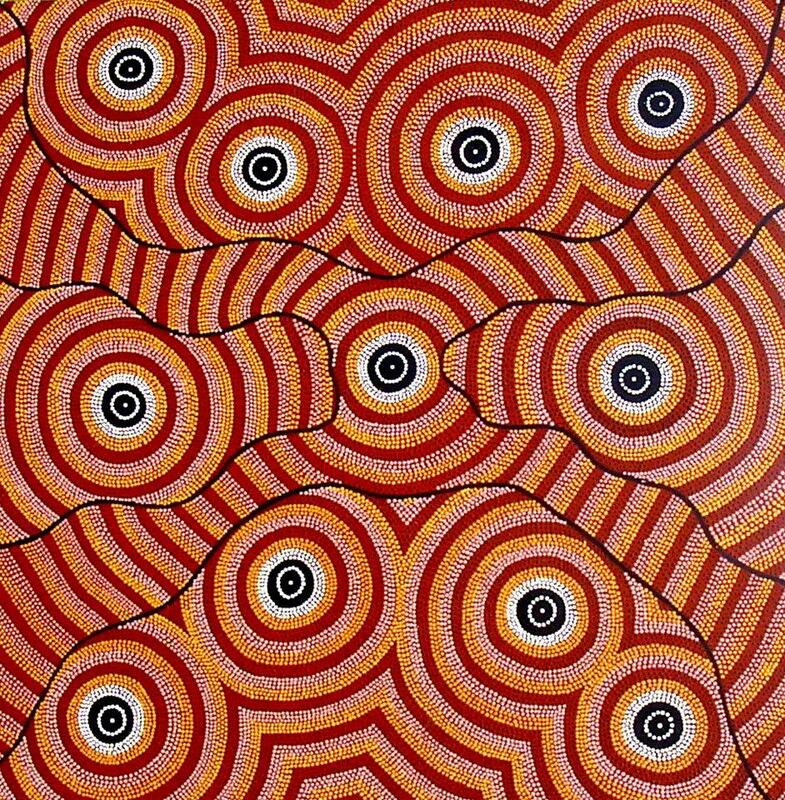 It is the last opportunity that anyone on this planet can purchase and own an authentic painting with impeccable provenance, by William Sandy, an important Australian Aboriginal Master artist. Today Aboriginal Australians live and work around the world, from Papunya to London, from Arnhem Land to New York. VIDEO: Prime Minister of Australia 1983-1991, Bob Hawke recognizes Galeria Aniela gallery contribution to Australian Aboriginal art. William Sandy work was exhibited in the significant 'Dreamings' exhibition which toured the USA in 1988 - 89, and in the subsequent show of Papunya Tula Artists at the John Weber Gallery in New York. William Sandy had a solo exhibition in 1990 at Gallery Gabrielle Pizzi, and the Aboriginal Desert Art Gallery Melbourne 1994-95-96-97-98. Grand Hyatt, Jakarta 1992, London 1993, Sydney 1994-95-96-97-98, Australian Embassy Washington and New York 1999. 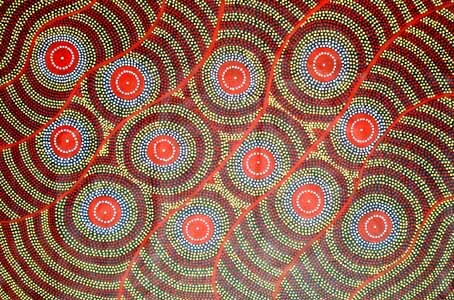 Since the early '80's when William Sandy began painting full-time for Papunya Tula Artists Galleries and the Aboriginal Desert Art Gallery in Alice Springs. Born circa 1944, near Ernabella in South Australia William Sandy has lived in Areyonga and Haasts Bluff in Papunya, with his family. At Papunya he married Violet Nakamarra, sister of Michael NELSON Jagamarra. They have four children, a boy and three girls, one adopted. William Sandy's wife, Violet Nakamarra, has also painted occasionally since the early '80's. From the time of his arrival in Papunya settlement, William worked for the Papunya Council. William Sandy is also a knowledgeable traditional medicine man. From the late '80's, William Sandy and his wife have been health workers with the Papunya Medical Service. William Sandy paints Dingo, Emu, Woman, Green Bean and other Dreaming stories for his country. Kunapi, far to the south of Papunya out towards Docker River, is his country from his grandmother and mothers side. William Sandy grew up walking around these places - and further north around Hermannsburg, Areyonga and Haasts Bluff. Eventually the family settled at Ernabella, where William attended the mission school. From here William Sandy came to Papunya in 1973. Literature : Amadio, N. und Kimber, R., Wildbird Dreaming. 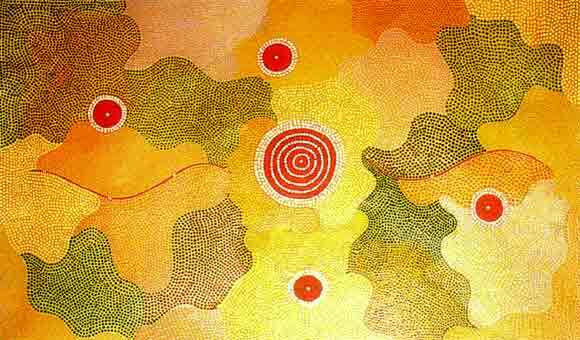 Aboriginal Art from the Central Deserts of Australia, Greenhouse Publ., Melbourne 1988; Auckland City Art Gallery, Auckland 1990, Ausst. Kat. ; Australian Aboriginal Art from the Collection of Donald Kahn. Lowe Art Museum, University of Miami (Hrsg. ), 1991, Ausst. Kat. ; Droombeelden - Tjukurrpa. Groninger Museum (Hrsg. ), Groningen 1995, Ausst. Kat. ; Isaacs, J., Australia´s Living Heritage. Arts of the Dreaming, Lansdowne Press, Sydney 1984; Isaacs, J., Australian Aboriginal Paintings. Lansdowne, Sydney 1989, ISBN 186302011X; Johnson, V., Aboriginal Artists of the Western Desert. A Biographical Dictionary, Craftsman House, East Roseville 1994, ISBN 9768097817; Modern Art - Ancient Icon. The Aboriginal Gallery of Dreamings (Hrsg. ), o.O. 1992, ISBN 0646080520; Nangara. 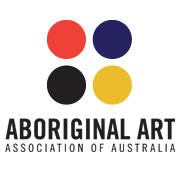 The Australian Aboriginal Art Exhibition from the Ebes Collection. The Aboriginal Gallery of Dreamings (Hrsg. ), Melbourne 1996, Ausst. Kat. ; Stourton, P. Corbally, Songlines and Dreamings. Lund Humphries Publ., London 1996, ISBN 0853316910; The Painted Dream. 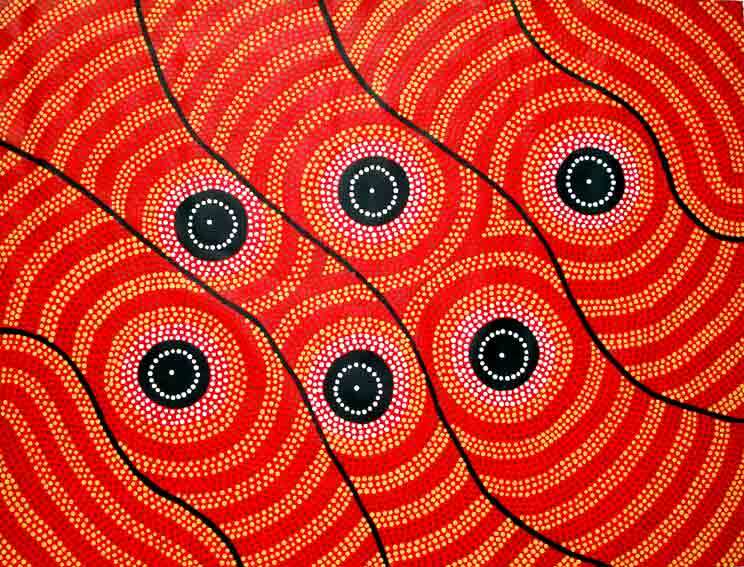 Contemporary Aboriginal Paintings. Johnson, V. (Hrsg. ), Auckland City Art Gallery, Auckland 1991, Ausst. Kat. ; Tjinytjilpa. 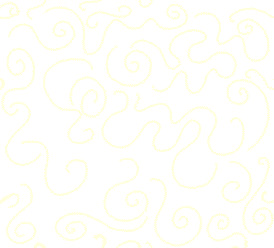 The Dotted Design. Aboriginal Art Galleries of Australia (Hrsg. ), Melbourne 1998, Ausst. Kat. ; Traumzeit - Tjukurrpa. Kunst der Aborigines der Western Desert. Die Donald Kahn-Sammlung, Danzker, J.B. (Hrsg. ), Prestel, München und New York 1994, Ausst. Kat. ; Voices of the Earth. 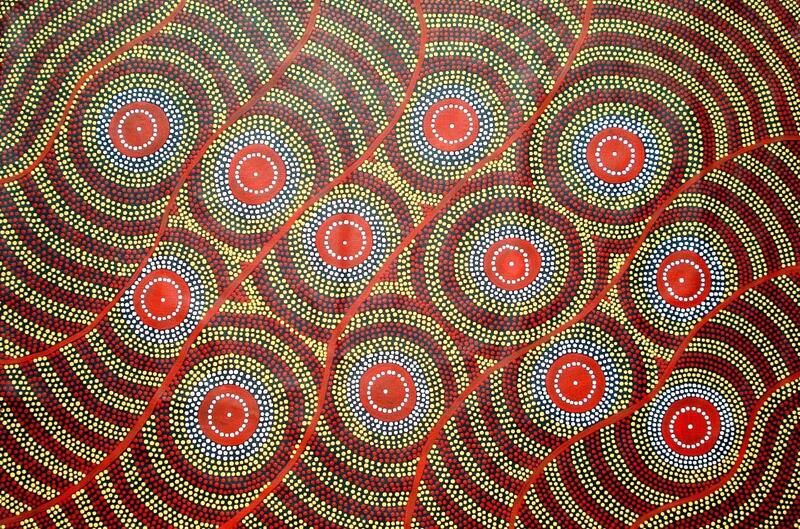 Paintings, Photography and Sculpture from Aboriginal Australia. Gabrielle Pizzi (Hrsg. 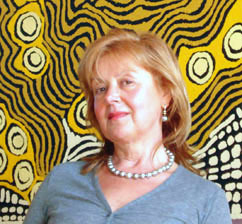 ), Gallery Gabrielle Pizzi, Melbourne 1996, Ausst. Kat., ISBN 0646288954. M useum-quality paintings boast the physical presence of the much contemporary works of art. Painted with finesse and fascinating accuracy of fine dots and subtle details, the paintings show the mysterious topography of the Bush Bean Ceremony landscape. The triptych is hypnotic and seems to move with the viewer’s eyes, giving an impression of multi-dimensional illusion of space and depth. Provenance: Warumpi Art Centre (1994-2004) the first Art Centre operated by Papunya Aboriginal artists . Bush Bean Ceremony (2001) is William Sandy Masterpiece boasting the physical presence of the much contemporary work of art. Painted in 2001 with great attention to details, finesse and fascinating accuracy of fine dots and subtle details, the painting shows the mysterious topography of the Bush Bean Ceremony landscape. The artwork is hypnotic, it seems to move with the viewer’s eyes giving an impression of multi-dimensional illusion of space and depth. Shipping worldwide delivery in 3-5 business days or Pick Up from Galeria Aniela. The vision of Galeria Aniela is to increase the awareness of the significant cultural contribution of artists and in particular Australian Indigenous artists . We aim to be a place of inspiration and experience through art collections, sculpture park and exhibitions . Modern and contemporary quality paintings and sculptures are displayed in expansive light-filled gallery exhibition rooms , sculpture park and an extensive stockroom. Browse gallery showrooms or purchase online, shipping worldwide usually dispatched within 24 hours, delivery in 3-5 business days or Pick Up from Galeria Aniela . With a wide network of resources and 24 years experience in the World Art Market we combine the knowledge of fine art and financial expertise. We recognize the importance of the buyer confidence in securing an authentic , ethically sourced work of art of impeccable provenance. We offer an opportunity to purchase museum-quality original works of art.